This Frozen Salted Caramel Mocha Hot Chocolate is a festive way to embrace the start of the holiday season. This easy drink is a sweet and creamy blend of hot chocolate, milk, and the rich flavors of salted caramel and mocha. Put a spin on traditional hot chocolate by serving this frozen drink instead! So, tell me, how early is too early to put up holiday decorations? I’m not talking about summer-time early, or even before Halloween, but is the week before Thanksgiving acceptable? Or do you wait until after turkey day to pull out your decorations? I absolutely LOVE decorating for the holidays! And now that the hubster and I are in our new house, I can’t wait to put our tree by the fireplace, set up the rest of the decorations, and then cozy up on the couch with a mug of hot chocolate to take in the view. But, the hubster and I have sort of a differing opinion on when it’s acceptable to decorate. I’m not one of those people who needs Christmas to be showing 24/7 in my house starting on November 1st (that’s a bit too early in my opinion). After all, we can’t forget about Thanksgiving! But as I’ve gotten older, I’ve realized that the time between Thanksgiving and Christmas is too short, way too short, in fact. Sometimes, there’s less than a month between the two holidays. And since we don’t decorate until after Thanksgiving, that leaves us with a short amount of time to enjoy Christmas and everything that goes along with it. Know what I mean? So, we’re going to compromise. We won’t put up our tree until after Thanksgiving. But, I’m going to decorate the rest of the house starting next week. Earlier, but not too early, and we can still enjoy Thanksgiving. When I was shopping at Walmart a few weeks ago to stock up on some holiday goodies, I came across International Delight® Coffee Creamers. I’ve talked about this product before (and used it in a few recipes) so you may remember my love for this creamer. Not only does International Delight® make my morning cup of coffee even better (especially when it’s enjoyed around the Christmas tree), but it also makes a delicious component to baked goods. And with seasonal flavors like International Delight® Peppermint Mocha Coffee Creamer and International Delight® Salted Caramel Mocha Coffee Creamer, you can be sure to find a flavor that everyone enjoys. So, after stocking up on a few different coffee creamers, I headed to enjoy a hot cup of coffee with a splash of International Delight® Peppermint Mocha Creamer, while brainstorming a new seasonal recipe that’s perfect for this time of year. If you’ve never had frozen hot chocolate before, then you’re definitely missing out! 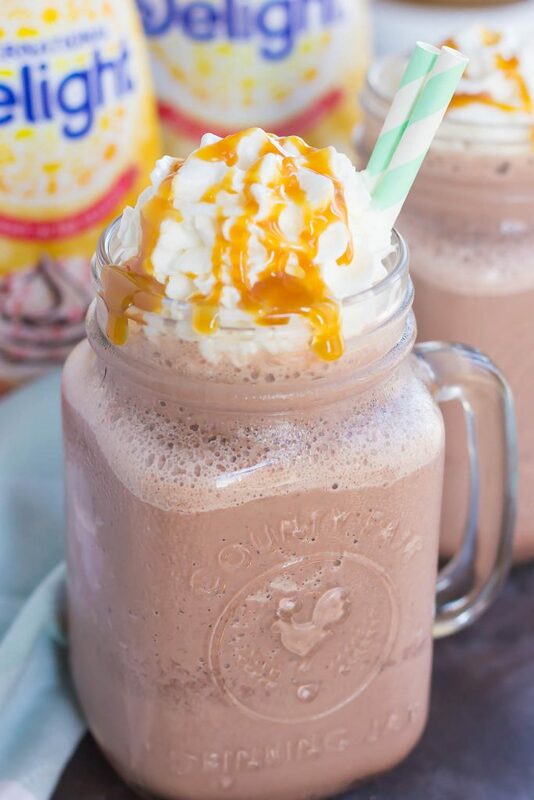 But, not to worry, this Frozen Salted Caramel Mocha Hot Chocolate takes less than 5 minutes to make, from start to finish. It’s smooth, thick and creamy and tastes just like a steaming mug of hot chocolate, but in frozen form. 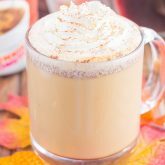 And by adding International Delight® Salted Caramel Mocha Coffee Creamer to this decadent drink, it kicks up the flavor into pure bliss. 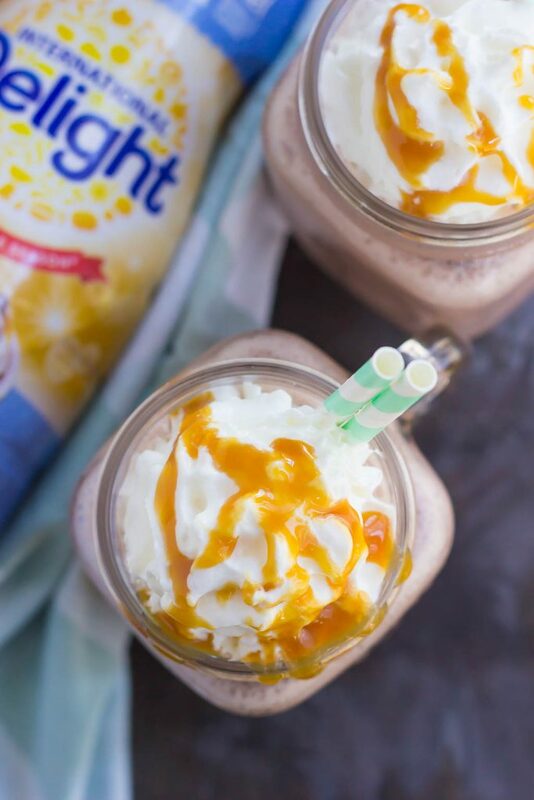 The sweet chocolate, rich coffee creamer, drizzle of caramel sauce and a touch of sea salt really bring this drink to life. 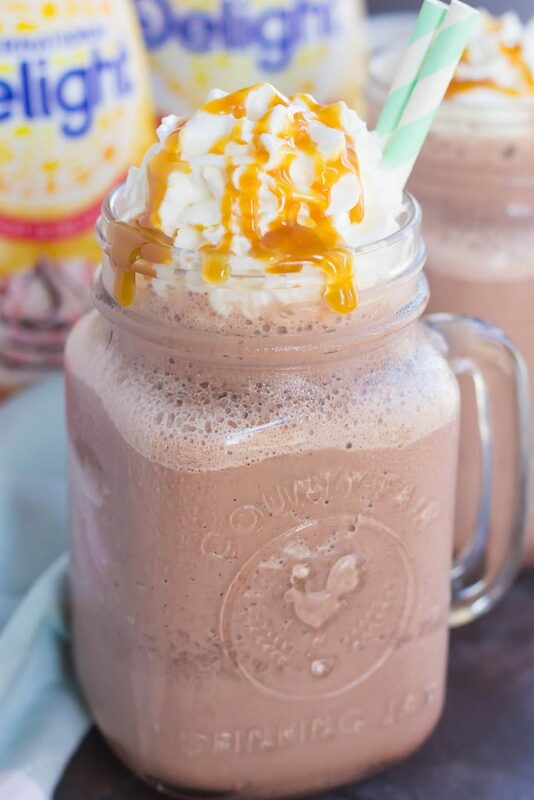 And like most of my recipes, this Frozen Salted Caramel Mocha Hot Chocolate is a breeze to whip up! But, you knew that was coming, right? Simply add everything to the canister of a blender and blend away. Pour into a tall glass, garnish with some whipped cream and caramel sauce, and your frozen hot chocolate will blow your taste buds away. 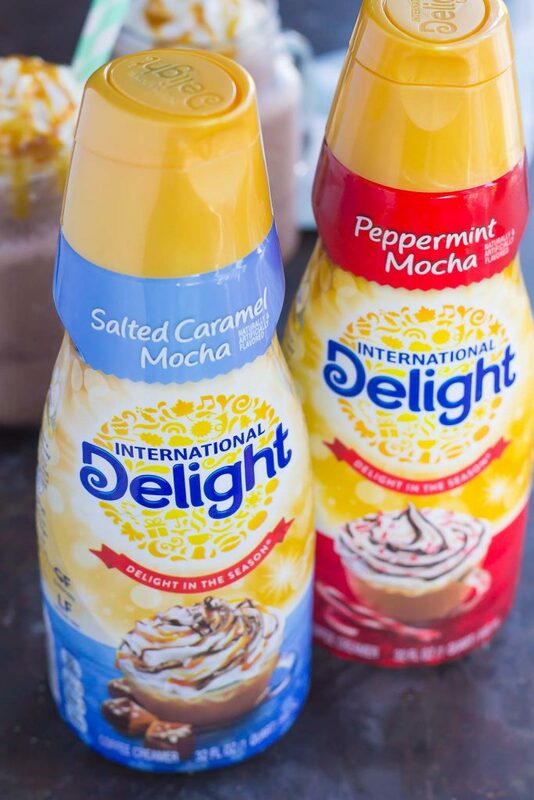 So, whether you want to start out your morning with a hot cup of coffee and your favorite creamer, or are looking to jazz up your favorite holiday drink, International Delight® has got you covered with their festive (and delicious) creamers! Into the canister of a blender, add the milk, International Delight® Salted Caramel Mocha Coffee Creamer, hot chocolate, caramel sauce, sea salt, and ice. Pour into two glasses and top with whipped cream and extra caramel sauce, if desired. Like what you see? 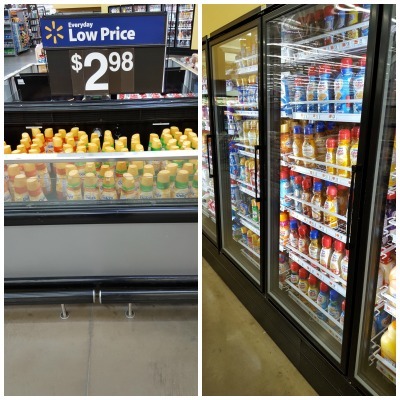 Then be sure to head to your nearest Walmart to find the full selection of International Delight® Coffee Creamers! You can also check out the in-store demo that will take place at Walmart over Thanksgiving weekend. I agree, Christmas tress need to be enjoyed for a while! :) Thanks for the kind words, Megan! Oh my gosh, I'm OBSESSED with the salted caramel mocha at Starbucks so this hot chocolate is right up my alley! I need to find that coffee creamer ASAP! This coffee creamer is SO good! Thanks, Sarah! Gayle, these frozen hot chocolate looks amazing!!!! I've got to try that Salted Caramel Mocha Coffee Creamer!!!! yummm!! love this! Our Thanksgiving here in Canada was in October so there's lots of time in between that and Christmas, but we usually don't put up decorations until December. I think that's a good time. The exterior lights usually go up first, followed by all the inside stuff. I'm getting exciting just even writing this now :D !! I can't believe that it's only about 6 weeks away and when I think of all the stuff that has to be done before then, I'm in shock! I really love frozen hot chocolate and you've totally gone over the top here with these one, Gayle! Love the caramel twist, especially salted caramel. It's definitely not to early to enjoy this one ;) Pinned, of course. Have a wonderful week!! I'm getting excited about Christmas, too! I think December is a good time to do that, especially since Thanksgiving is earlier for you. Thanks for the hot chocolate love and pin, friend! I've always been told that the "PC" way to decorate is to wait until after Thanksgiving. BUT, I am all for doing what you want, Gayle!! If you want to put up decorations now - DO IT! Don't let what other people think or do dictate your life. Both the holiday season AND life are way to short for that nonsense! Now I fully expect to see Christmas decorations in (and on) your house. Lol. ;) Anyways, let's talk drinks! Guuuurl, my husband would FREAK out over this beauty! 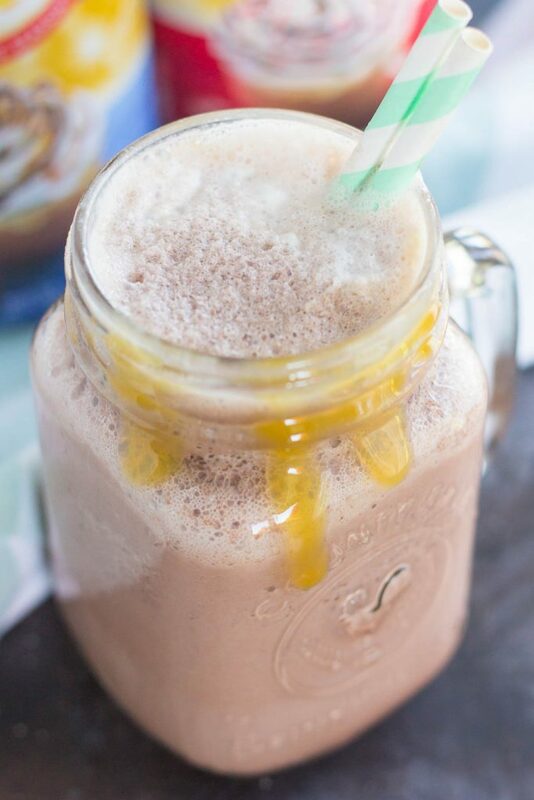 I mean the name says it all - Frozen Salted Caramel Mocha Hot Chocolate! Salted caramel AND mocha flavored hot chocolate? Daaaaang. SO MUCH YES! I have to make this for Boy pronto! Pinned of course! Cheers! Yep, waiting until after Thanksgiving is definitely the "pc" way for most people, but I'm defying that this year! I can't wait to decorate! :) Thanks for much for the hot chocolate love and pin, friend! I am with you 100%!! The time is just too short for all the beauty that we invest so much time and energy in, if we wait until after Thanksgiving! We won't put our tree up until after but I am all about the rest trickling in at any point now! And man is this a perfect beverage for sitting by the tree! Can't wait! I love that you're going to decorate for Christmas next week, Gayle! I think I might have to do that too. ;) I've never had frozen hot chocolate, and this looks amazing! I'm loving your photos in this post, with all of that drippy caramel! I typically wait until after Thanksgiving to decorate, but I've been sneaking a peek at our box of decorations and getting antsy. I think, like you guys, our tree will wait but some festiveness will make its way out a little early. :) Frozen hot chocolate sounds like just the refreshment to sip on while decorating! Yay for early festivities! :) I can't wait to start decorating. Thanks for the kind words, Alyssa! I put my Christmas tree up on Friday! That's generally our rule -- November 11. But that's about a month after our Thanksgiving here so I feel totally justified! I am totally on board with all things holiday, especially all the festive drinks! I love your thinking, and I think that totally justifies your reasoning. Yay for putting up your Christmas tree! I've found that I put up the Christmas tree earlier and earlier each year. But it's not really my fault. The fresh trees are available earlier each year, and one year when I went to get one the day after Thanksgiving they were already gone where I buy them! Crazy. This drink is everything I want. Seriously. I could eat the pictures! Wow trees sell out fast by you! I don't blame you for decorating early! :) Thanks for the drink love, Amanda! Thank you, Rachel! And I agree...I love when towns and streets decorate. It looks so pretty, especially with snow! I just tried this creamer and I can say it tastes awesome! This latte looks perfect! Can't wait to try and make it myself! I think it is time for me to start decorating for Christmas, because time flies! Thank you, Mira! Isn't that creamer so good? And yay for Christmas decorating! haha I debate over when to put up decorations every year! I usually wait until after turkey day but man, this year I am feeling the itch now! PS this mocha sounds delicious! I put up Christmas decorations the day after Thanksgiving and never a day sooner -- I love my harvest decorations and am always sorry to see them go. :( This mocha has everything that I love, and I'm loving that caramel drizzle! That is so true, Marcie...I love my fall decorations too! Thanks for the kind words! Ugh why does time go by so fast?! I just don't get it! :) And yay for everything frozen, even in the winter! Thanks for the sweet comment and pin, friend! Yes! I love putting decorations up but HATE taking them down when it feels like they just went up. Thanks for the hot chocolate love, friend! I would decorate right now if my husband would let me! :) Instead I just have to settle for listening to Christmas music until the day after Thanksgiving. Love your sweet treat. 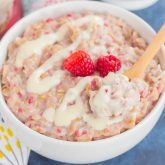 The flavors are delicious and it's super easy. Perfect! Christmas is my husband's FAVORITE and he seriously always decorates the day after Halloween lol! Yay and it will be SO much for you to decorate your new home this year :) This mocha looks and sounds SO yummy especially while you're putting up the tree! Love the caramel drizzle! Haha that's too funny that your husband decorates then! How fun, though! Thanks for the mocha love, Kelly! I'm not a huge fan of Christmas decorations before Halloween, but I certainly understand the excitement of the holiday season! This hot chocolate certainly makes me excited for the holidays! I'm not either, anything before Halloween is too early! Thanks for the kind words, Rachel! This looks delicious! I love everything about it; frozen, salted caramel, mocha - all of it! OMG OMG OMG OMG I need this! You are truly brilliant. Yum, what a wonderful presentation! 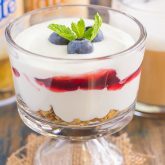 Perfect for those sweet tooth craving! My husband is like you; he wants to put up decorations as early as possible. I prefer to just keep them up longer into the New Year :) This drink is a great way to get in the holiday spirit - must try!! Thanks for the kind words and for stopping by, Stacey! 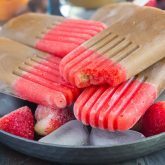 I love salted caramel anything, this sounds so good! OMG salted caramel!!!!!! Looks so GOOD!!! How could one not love this??? Thankyou???? It's so good, Julie! Hope you love this if you try it!